Canada’s second-quarter gross domestic product (GDP) growth of 4.5 per cent triggered two back-to-back rate hikes by the Bank of Canada. But today, Statistics Canada released data showing a slowdown in the monthly industry data for July. 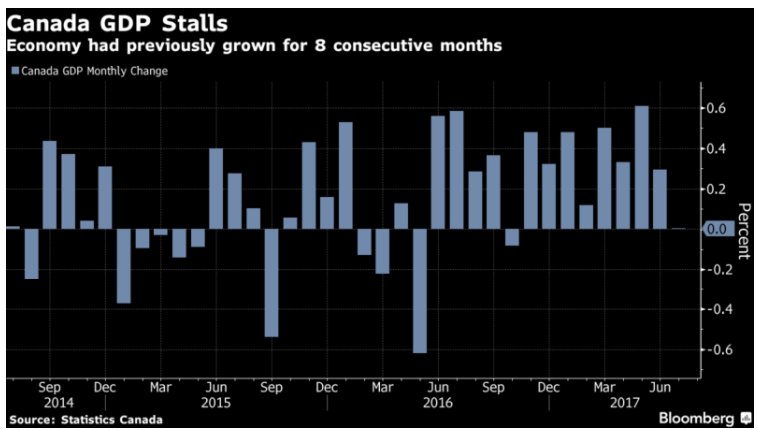 Canadian GDP held steady in July ending an eight-month streak of cosmic expansion. This slowing is consistent with the Bank of Canada’s recently expressed view that the outsized pace of growth over the last year is not sustainable going forward. Slumping oil and automobile production and a slowing housing market were among the biggest drags on growth in July. The figures seem to show the downturn in housing has become a drag. Credit intermediation was down one per cent, residential construction dropped 0.9 per cent, and activity at real estate agents declined 1.5 per cent. The finance and insurance sector’s decline of 0.6 per cent was the largest since April 2015. A slowdown from the year-over-year pace of 3.7 per cent is not a bad thing, and there is plenty of room for the economy to continue to grow at an above-potential rate. 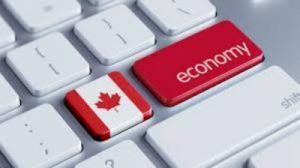 It is still likely that the economy will grow at a solid 2.5 per cent pace in the third quarter, data for which will be released on Friday, Dec. 1 when we will also see the November employment report. Monetary policymakers will remain cautious owing to ongoing concerns about the strength of the Canadian dollar, risks associated with the NAFTA renegotiations, and the still below-target inflation readings. Moreover, U.S. trade policy is becoming ever more belligerent as evidenced by the heavy duty imposed on Bombardier, which has caused shock waves throughout Canadian industry. With the stunner of a 219 per cent tariff on Bombardier’s CSeries jets, The U.S. Commerce Secretary Wilbur Ross touted a 48 per cent increase from 2016 in anti-dumping and countervailing cases initiated by the U.S. Department of Commerce. That’s on the heels of a study that found a 26 per cent spike in U.S. trade actions against G20 partners in the first half of this year from the same period in 2016, according to the Center for Economic Policy Research’s Global Trade Alert. The Canadian softwood lumber industry has been tasting this punitive medicine for months. These U.S. trade policies create uncertainty across the manufacturing sector, including those supplying raw materials. The aggressive move threatens to disrupt the well-integrated manufacturing processes between Canada and the U.S., with industries such as steel and aluminum smelting possibly hit by collateral damage from the trade talks. Today’s report is the last set of GDP data before the Bank of Canada’s next rate decision on October 25. Governor Stephen Poloz said earlier this week policymakers would proceed “cautiously” as they gauge the impact of the two interest rate increases.